Antenatal diagnosis of fused umbilical arteries by ultrasonography. A thirty-eight-year-old woman with gravida:2 parity:1 has got pregnant with ovulation induction.One of the fetuses of twin pregnancy had cystic hygroma at 11 weeks of gestation. Fetal reduction was performed to the anomalous fetus.At 25th weeks of gestation ultrasonography of umbilical cord revealed two arteries and single vein near fetal side,a single artery and single vein close to placental insertion. The clinical significance of fused umbilical arteries is not well known.Compared to the cases of single umbilical artery, fetal anomaly accompanies fused umbilical arteries cases less frequently.Therefore,in order to diagnose antenatally fused umbilical arteries,total lenght of umbilical cord should be evaluated ultrasonographically. We, in our study, aimed to discuss ultrasonographic and pathological diagnosis of UAF as a case report. A thirty-eight-year-old woman with gravida: 2 parity:1 has got pregnant with ovulation induction. One of the fetuses of twin pregnancy had cystic hygroma at 11th gestational week. Fetal reduction was performed to the anomalous fetus. At 25th gestational week ultrasonography of umbilical cord revealed two arteries and single vein near fetal side, a single artery and single vein close to placental insertion (Figure 1). No other anomaly was found in fetus, placenta and cord. She was taken into cesarean operation on repeated cesarean diagnosis on 39th gestational week. A male baby about 3450 g was born with 10/10 Apgar score by crown arrival. Placenta and its supplements were sent to pathology. She was dispatched from our clinic on postoperative second day when she and baby’s health were fine. The cord was taken into pathological examination as two parts as fetal and placental. 3 vascular lumens consisting of 2 arteries and 1 vein were observed on section surface of fetal part; it was found that appearance with 3 lumens in placental part disappeared and that it continued as 1 artery and 1 vein after fusion of 2 vascular elements (2 arteries) on one area. Fusion area and sections taken from other areas were painted with Hematoxylene – Eosin (HE) and determined histopathologically. Fusion of two arteries was observed microscopically (Figure 2). Consequently, even though UAF incidence is frequently occurs as single artery-single vein, antenatal diagnosis is an anomaly which is not noticed due to failure of cord examination frequently as a whole.It would be useful to separate it from single artery-single vein anomaly accompanying fetal anomalies frequently due to the fact that it accompanies fetal anomalies rarely and umbilical cord is required for antenatal diagnosis for examining as a whole, not by a single section. Thus, umbilical cord should be examined in sections close to fetal and placental areas. 1. Chantler C, Baum JD, Wigglesworth JS, Scopes JW. Giant umbilical cord associated with a patent urachus and fused umbilical arteries. J Obstet Gynaecol Br Commonw 1969; 76: 273-4. 2. Sepulveda W, Dezerega V, Carstens E, Gutierrez J. Fused umbilical arteries: prenatal sonographic diagnosis and clinical significance. J Ultrasound Med 2001; 20: 59-62. 3. Fujikura T. Fused umblical arteries near placental cord insertion. Am J Obstet Gynecol 2003; 188: 765-7. 4. Heifetz SA. Single umbilical artery. A statistical analysis of 237 autopsy cases and review of the literature. Perspect Pediatr Pathol 1984; 8: 345-378. 5. Yamada S, Hamanishi J, Tanada S, Tachibana M, Mimura R, Fujii S et al. Embryogenesis of fused umbilical arteries in human embryos. Am J Obstet Gynecol 2005; 193: 1709-15. 6. Jassani MN, Brennan JN et al. Prenatal diagnosis of single umblical artery by ultrasound. J Clin Ultrasound 1980; 8: 447-8. 7. Benirschke K, Kaufmann P. Umbilical cord and major fetal vessels. In: Pathology of Human Placenta. New York: Springer-Verlag; 1990. p.180-3. 8. Sepulveda W, Bower S, Flack NJ. Discordant iliac and femoral artery velocity waveforms in fetuses with single umblical artery. Am J Obstet Gynecol 1994;171: 521-5. 9. 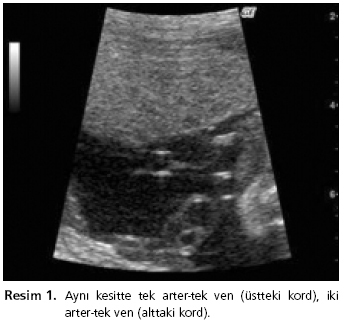 Sener T, Tan›r HM, Hassa H, Çakmak B. Fused umbilical artery found in a case of twin pregnancy: a case report. J Turk›sh German Gynecol Assoc 2005; 6: 57-8. Single artery – single vein on the same section (upper cord), two arteries–single vein(lower cord). Microscopic appearance of the fusion of arteries. (HE X 20).